Type ll Assemblies | Backflow Solutions, Inc. 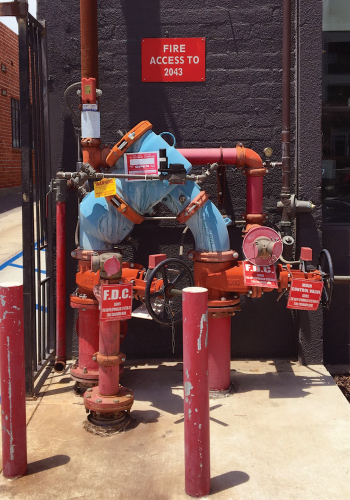 Through the evolution process of backflow prevention assemblies, the detector assembly was created for use primarily in fire protection system installations. The concept was to add a detector assembly and low flow meter to detect leaks or unauthorized usage within the fire protection system. While the mainline backflow assembly was typically in the 4” to 10” range, the detector assembly was either ½” or ¾”. A mainline RP would be paired with a detector RP, and similarly a mainline DC would be paired with a detector DC. Each assembly has a unique serial number, model and size. Since the RPDA consisted of two separate RP approved assemblies and the DCDA consisted of two separate DC approved assemblies, the testing and tracking of the two assemblies were treated separately. This became the standard for nearly 30 years until the introduction of the Type II bypass for detector assemblies. In the early 2000’s, a new idea began to emerge regarding detector assembly design. Instead of having a second RP or DC for the detector assembly, the idea was developed to utilize a single check valve (SCV). This became known as the Type II bypass and two new acronyms were born – DCDA-II and RPDA-II. In 2005, ASSE revised the RPDA standard (ASSE 1047) and the DCDA standard (ASSE 1048) to include the use of this new SCV. Likewise, USC Foundation for Cross-Connection Control and Hydraulic Research (Foundation) began approving the new assembly designs for manufacturers like Apollo, Febco and Backflow Direct. With the new design, the debate began within the industry as to whether the new detector assemblies would continue to be treated as two separate assemblies (as has been the history of the original detectors) or would they be treated as one singular assembly. Looking at the new ASSE standards and the Foundation approval process, we are given a clear answer. The Foundation determined that the new assembly design would only be approved as one singular assembly. This was determined for one reason – the single check valve. The SCV is a device and not an assembly. Therefore, it is not approved as sufficient stand-alone protection as was the case of the RP or the DC in the previous design. As such, the testing procedures for the new Type II detector assemblies were written by both ASSE and the Foundation as one set of procedures as one assembly to be documented on one test report. The RPDA-II test report would have 4 readings – Check Valve # 1, Check Valve # 2, Relief Valve Opening, and Single Check Bypass. Likewise, the DCDA-II test report would have 3 readings – Check Valve # 1, Check Valve # 2, and Single Check Bypass. From the Foundation Edition 10, the RPDA-II procedure is as follows: 1) Test mainline RP per normal USC procedures, 2) Test that the single check valve holds tight in the direction of flow with a minimum of 1.0 psid. Similarly, the DCDA-II procedure is as follows: 1) Test that the single check valve holds tight in the direction of flow with a minimum of 1.0 psid, 2) Test mainline DC per normal USC procedures. From the ASSE 2015 standards, the RPDA-II procedure is as follows: 1) Test mainline RP per normal ASSE procedures, 2) Test that the single check valve holds tight against backpressure. Similarly, the DCDA-II procedure is as follows: 1) Test mainline DC per normal ASSE procedures, 2) Test that the single check valve holds tight in the direction of flow with a minimum of 0.5 psid.